01 What are the basic requirements of kyudo practice? Are there any age and gender restrictions? 02 What are the differences between kyudo and Western archery? 03 What equipment is required for practice? 04 How does the training start? 05 When can one start to train in front of a mato (target)? 06 Does kyudo have different ryu (schools)? What kind of kyudo is practised at the Hong Kong Kyudo Association?? 07 Is kyudo practice safe? 08 Does the Hong Kong Kyudo Association hold examinations? 01 What are the basic requirements of kyudo practice? Are there any age and gender restrictions? There are no specific age and gender restrictions in modern kyudo practice. However, kyudo requires good physical health in order to handle the bow and perform the required movements and postures such as seiza (traditional Japanese formal sitting on the floor, with the legs folded underneath the thighs). HKKA currently only accept applicants over 15 years of age. Also, due to limitation of the current venue, HKKA can only accept applicants with a body height of not more than 185cm. Like Western archery, kyudo can be enjoyed as a sport that involves the act of shooting a bow and arrows. However, this is not the purpose of kyudo practice. Kyudo as an Eastern discipline, also includes a spiritual aspect. The key to the practice is to learn with sincerity and courtesy. Through regular practice, kyudo can deepen our life experience through self-examination and develop a sense of respect for others. Taking care and maintaining kyudo equipment is part of the practice. As such, all members are required to own the appropriate clothing and their own kyudo equipment. Members may consider acquiring these in various stages to help with the costs. All members (once completed the beginners' training sessions) should own the appropriate clothing. This includes a kyudo-gi (white top), hakama (traditional skirt / trousers), obi (cloth belt) and tabi (split-toed socks), as well as muneate (chest protection) for female members. A gomu yumi (rubber bow) is essential for basic form training. Once they start practising on makiwara (close target stop), members are also required to purchase a shita-gake (under glove) and makiwara arrow. The total cost of these essentials is about HKD1,500. The rest of the equipment can initially be borrowed from HKKA. 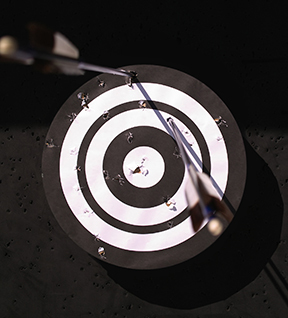 Once they start practising on the mato (target) , it is recommended that members purchase a kake (glove) , a minimum of 4 ya (arrows) and a yumi (bow). Costs vary for these items and a senior member will advise before purchase. Beginners will be taught the kihontai (fundamental form) and shaho-hassetsu (eight stages of shooting) in the Kyudo Introductory Sessions. Some other knowledge about practising kyudo, including kyudo equipment and dojo protocol will also be covered. Kyudo training requires commitment. As such, the Kyudo Introductory Sessions are only meant to provide a general introduction to allow us to decide whether we want to commit to this practice. This depends entirely on the progress made by each person in learning the basic form. Some people get the basics in a few weeks, others take longer. 06 Does kyudo have different ryu (schools)? What kind of kyudo is practised at the Hong Kong Kyudo Association? Like other Japanese budo, kyudo still has many different ruy (schools) nowadays. The Hong Kong Kyudo Association practises the standard kyudo from the All Nippon Kyudo Federation (ANKF). Safety is paramount in kyudo practice and always the first objective. Kyudo has an excellent safety record due to the safety rules applied in all dojo. Our current dojo is set up according to the guidelines from the Kyudo Manual issued by the All Nippon Kyudo Federation (ANKF). Although there are differences between our practice location and a traditional dojo, it is still a "place of training" (dojo) under the supervision of a dojo leader and the group functions as in any dojo, i.e. with the active participation of all members. The All Nippon Kyudo Federation (ANKF) and the International Kyudo Federation (IKYF) are the only official bodies to hold grading examinations. HKKA encourages all members to take part in the examinations and seminars every year, and will assist members for registration and preparation.